By Sir Edwin Lester Arnold (1832 - 1904), introduction by Alan Jacobs.
" There lives a Master in the hearts of Men, maketh their deeds, by subtle pulling-strings, dance to what tune He will. With all thy Soul Trust Him, and take Him for thy succour, Prince! " 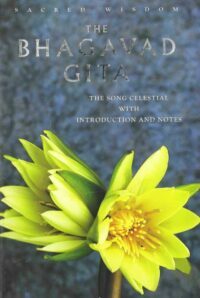 The Bhagavad Gita, or Song Celestial, is the sacred testament central to Hinduism, the most ancient of the great world religions. Brahman is the Absolute Supreme Reality underlying all forms. Human beings accumulate Karma as a result of their actions in innumerable incarnations, until they obtain liberation through the practices of devotion and knowledge. The Bhagavad Gita, as the essential gospel of Hinduism, explains mankind's predicament and points the way to freedom. This poetic gospel is attributed to the Divine Messenger, Lord Krishna, who on the battlefield gives the warrior-prince, Arjuna, detailed and profound spiritual guidance. Arjuna is perplexed by his involvement in a war and Lord Krishna unveils inspiring philosophical wisdom leading to the solution of Arjuna's problem and his self-realization.